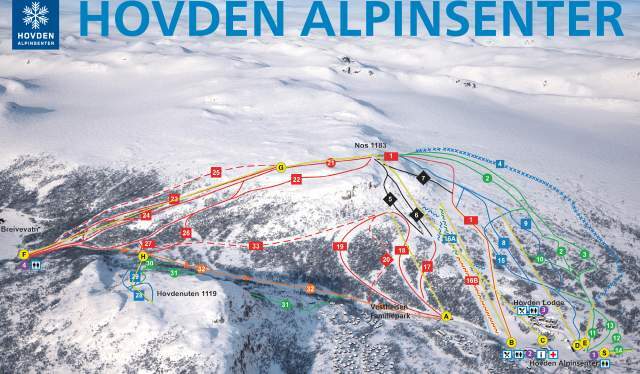 Piste map Hovden alpine center. The chairlift to the summit Nos in Hovden has been in operation since 1968. Today, the Hovden Alpine Centre is modern and well adapted to every age and skill level - from the youngest children to extreme skiers and snowboarders. 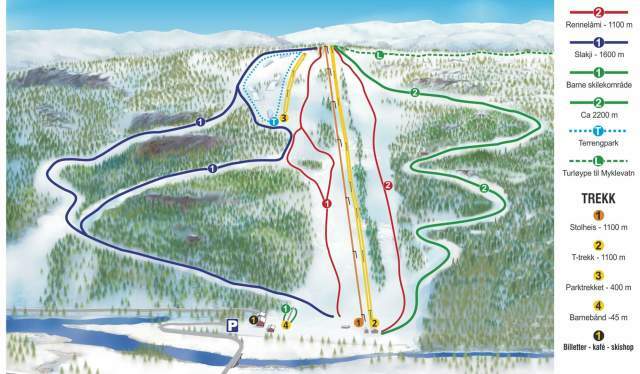 With its 33 pistes, nine lifts and a total of 42,5 kilometres of groomed descent, Hovden Alpine Centre offers a variety of slopes for every skill level. The service building has ski rental facilities and a ski repair shop, café, cafeteria, after-ski and bistro, all under the same roof. Piste map Brokke Alpine Center. A small, but very family-friendly alpine centre. One 3-seat express lift and three ski-tows. The service building has a cafeteria and ski rental facilities with alpine skis and snowboards. The alpine centre is open in weekends. Terrain park in Hovden Alpine Centre. The terrain park is the place for those who want to explore their acrobatic skills. Big jumps, quarter pipes, funboxes and rails are some of the elements. 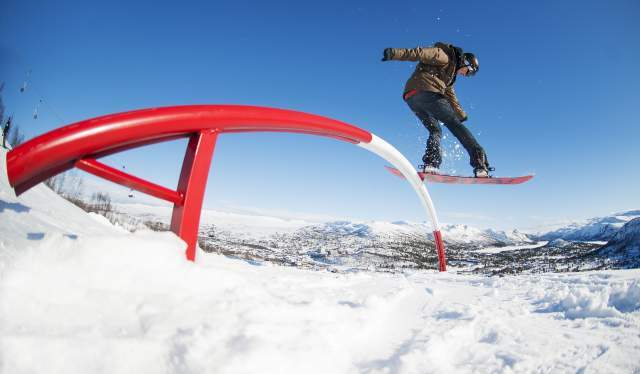 In Hovden Alpine Centre the 1250-metre Bukkerittet (the Buckride) terrain park is considered one of the best snowboard parks in Norway. The park offers exiting features such as rails, boxes, big jumps, funboxes and various other jumps. The terrain parks are suitable for beginners as well as for more advanced skiers.